After the terrorist attacks of September 11, 2001, and with the establishment of the Department of Homeland Security, the academic field of Homeland Security has grown exponentially. Until now, no text existed that addressed the need for a definitive textbook on this rapidly expanding field. 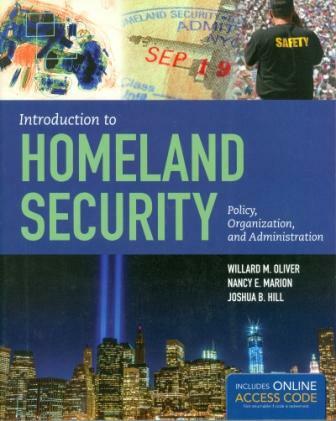 Suitable for undergraduate students entering the field of Homeland Security, and for Criminal Justice students studying their role in a post-9/11 world, Introduction to Homeland Security: Policy, Organization, and Administration is a comprehensive but accessible text designed for students seeking a thorough overview of the policies, administrations, and organizations that fall under Homeland Security. The only text of its kind available on the market, Introduction to Homeland Security offers grounding in the basic issues of homeland security, the history and context of the field, and what the future of the field might hold. Students will come away with a solid understanding of the central issues surrounding Homeland Security, including policy concepts and political and legal responses to Homeland Security. Authored by leading experts in the field, Introduction to Homeland Security: Policy, Organization, and Administration is the essential text on understanding Homeland Security in America today. Every new printed copy is packaged with an access code to unlock the numerous interactive learning and study tools available on the Navigate Companion Website, including practice quizzes to help students gauge their comprehension of the material and scenario exercises in which they will be immersed in the role of Homeland Security personnel and make decisions based on what they have learned.